Express Employment, provides a full line of staffing services (temporary, flexible, evaluation hire, direct hire, and professional/contract staffing) and HR Business Solutions to individuals and businesses in nearly 600 locations in the United States, Canada, and South Africa. Express Employment provides a sales-focused, business to business opportunity in one of the top ten fastest growing industries in the US. Our franchise model allows you to develop a professional business coupled with the ability to maintain a balanced lifestyle and build a solid, scalable, equitable business. Our mission is to help as many people as possible find good jobs by helping as many clients as possible find good people. 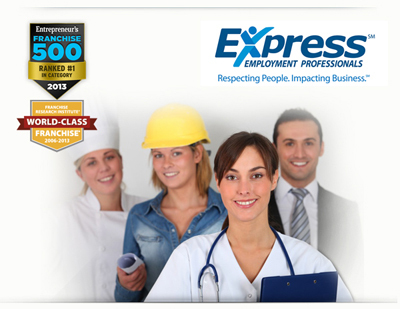 Express employs more than 350,000 people and serves more than 30,000+ clients annually.